Strawberries are great for your skin. Scented with a blend of strawberry and lime, with a dash of added goat's milk, your skin will love this soap. Raw shea butter, organic coconut milk, and an absolutely mouthwatering fragrance. Liquid silk combines with our oil blend for a luscious lather, in this lilac scented soap. Creamy goat milk, local honey and ground oatmeal....everyone's favorite. The fragrance of patchouli is always a classic favorite. Mixed with blueberry fiber and ultramarine blue for a bit of color, you will love this soap. The masculine scent of teak and mahogany round out this soap, made from our vegetable oil blend with added goat's milk. Green tea and poppy seeds added to our signature blend of oils. Greek yogurt added to our vegetable oil blend add moisturizing properties to this artistic soap. Raspberries and buttermilk combine to make this a great soap for your whole body. Raspberry seeds for exfoliation. This soap has a wonderful lather and smells delicious. Lake Michigan calls to you from this soap....lake breeze and sand dunes. Fresh from the farm with goats milk and oils infused with dandelion and violets. A blend of juicy watermelon and tart lemonade. Greek yogurt gives a creamy lather. A kaleidoscope of colors including french green clay and rose hip powder...the earthy fragrance of oakmoss and sandalwood. Our greek yogurt soaps are a hit...this one is scented with a blend of currants, berries and a touch of sandalwood. Pumice gives this soap some grit, making it a perfect "mechanic's soap" for dirty hands. Mystery grab bag! 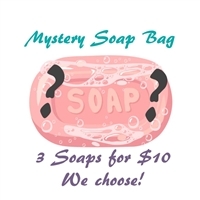 3 soaps for $10, our choice. Order your favorite soap in bulk and save!